rebecca likes nails: rebecca likes nails turns 3! + GIVEAWAY! The time has come for another blogiversary celebration! Three whole years and I still can't thank all you lovely people enough for supporting me all this time! Even when things become a bit... Sporadic. Haha! I'm feeling great about what the year has in store for RLN, so let's start the year off right with some giveaway goodies! One lucky winner will receive the following prize package! I hope you guys like the little prize I put together. I can't wait to send it to one of you! This giveaway is open internationally and will run through February 6th, 2014. Entering the giveaway is simple! Use the Rafflecopter below. Good luck! I like the layla hologram effect in coral glam. I am most excited for your Picture Polish!! Definitely Picture Polish Siren Song! Your piCture pOlish is stunning. I really need to get around to getting it. YAY! Happy Blogiversary! If I didn't already have Siren Song, that would be the one I was most excited about. I love the OPI set! Thanks again! Siren song and the layla holographic!! OPI Fit to be Tied Gift Set. Happy 3rd blogiversary! Siren Song is the prize I'd be most excited for! Happy Blogiversary!!!! Siren Song would definitely be the highlight of this prize pack for me! It's been on my wishlist since you first showed swatches! I would love to win Siren Song. I just can't get enough shimmer. All of it of course!!! Siren Song is gorgeous though! Happy Blogiversary!! All of the prizes are amazing but I'm most excited for piCture pOlish Siren Song!! Thank you very much for giving us this opportunity! The OPI to be tied gift set is awesome! HAPPY BLOGGY BIRTHDAY with sprinkles on top! Wishes for many happy bloggy years to come! Congrats on your anniversary!!! You've been a wonderful treat to follow!!! Awesome giveaway! I would be thrilled to win. How could I choose? Everything looks amazing. I have OPI polka.com so if I won (fingers crossed) I would love to give it to another person who entered. Best of luck to everyone and thanks so much for the opportunity. Siren Song :) Picture Polish is so hard to get in my country! The Siren Song polish is just amazing ! Happy Blogaversary! Super excited about your Picture Polish, but the Layla is pretty awesome too!! I'm most excited for the gloves, can you blieve it?? Haha! The OPI Fit to be Tied Gift Set is beautiful! Happy blogversary! probably Russian Navy! I'm excited about piCture pOlish Siren Song! I love to read your blog and then being a bit jealous about all the lovely polishes you are writing about. The whole giveaway is awesome and I would love to try all of it. I can´t even pick one fave thing, I love them all! The Layla Hologram Effects is what I'm eyeing! Thanks for the giveaway, and congratulations on 3 years of blogging! Happy blogbirthday girl!I am excited about all prizes because here in Greece we don't have those!Thanks for,the chance! Happy 3 years! :) I've been want siren song for a while!! Thanks for the giveaway! I'd be most excited about the Picture Polish and the Layla. happy blogiversary! those are all amazing items! Good luck everybody,thank you so much for the giveaway,much much love!! Siren Song! Thanks for a chance to win! Happy blogiversary! I'm excited for Layla Hologram Effect! Thanks for the giveaway! Definitely Siren Song and the Mascara! I'd love to add Layla Hologram Effect as I don't have any in my stash. I want Siren Song ~ Thank you for the giveaway! Most excited about the Joe Fresh- Iris! Very happy blogiversary!!! :) And thank you for having this amazing give-away! If I won I would be the most excited to try Siren Song. I don't own a lot of Picture Polish, but love the ones I do own. Congrats on the 3 yrs!!!!! I think i am most excited to win the piCture pOlish, because i don't have none of this brand polish! This is such an exciting Giveaway! Layla Hologram Effect - Coral Glam looks the most exciting for me, I don't own any holographic polish so would love to win this one, although everything looks pretty exciting! Would totally love to own my first Picture Polish! Siren song excites me the most, definitely! My favourite is the Layla nailpolish, Coral glam. I've never tried a hologram nail polish and what better way than to try one out by a brand thats also my nickname! Happy Anniversary! I'd really love the Picture Polish as I have yet to add one to my collection! Siren Song please! Happy 3rd Anniversary!! Happy anniversery! The gloves, your own polish and the holographic polish are amazing! Def Siren Song! 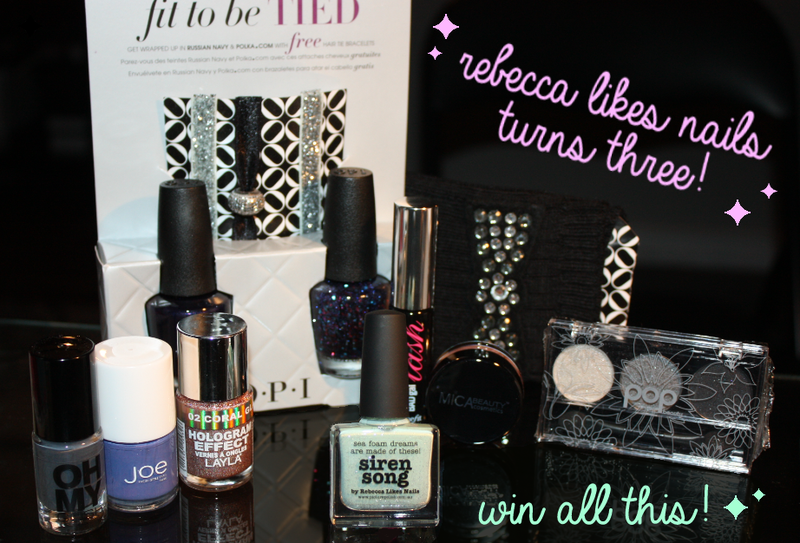 You've made yourself a really gorgeous polishes there =) Congrats and thanks for this giveaway! The Fit To Be Tied set looks awesome! Congrats for the 3 years!! I would be most excited for Siren Song! Thanks for hosting the giveaway! Congrats and thanks for this giveaway! I'd be most excited to win Siren Song. Happy Blogaversary! I love your blog! I'm so excited for the OPI set and the Picture Polish :) Thanks so much and Happy Anniversary!!! piCture pOlish Siren Song I love! Your piCture pOlish shade!! It's such a gorgeous and unique polish, congrats! I'm in loooove with mint green (it's totally my problem colour) so I'd love to get Siren Song! OPI Fingerless Gloves is what I am most excited for. Siren Song and the GOSH polish! A tie between the Picture Polish and the Layla Hologram Effect polish! Love everything though! Thanks for the chance! Siren Song is SO beautiful!! I really love the Layla and the Picture Polish. I don't have any linear holos so that would be a welcome addition to my collection and I've always wanted to try Picture Polish, especially their collaboration shades, I think they're just dynamite. I am most excited for piCture pOlish Siren Song. Probably the Joe Fresh polish, I've never tried that brand before! I love Pop Beauty Eyeshadow Trio in Smokin Hot. I love piCture pOlish Siren Song! The piCture pOlish Siren Song and Layla definitely! Picture Polish Siren Song! I've never tried Picture Polish and would love to! piCture pOlish Siren Song !!!! I'm really excited for the Benefit Bad Gal Lash! I'm so excited about the Polka.com nail polish! I'd like the Benefit Bad Gal mascara. Thanks for the giveaway! I'd love any of the OPI products. Those fingerless gloves sound awesome as well as the polishes of course. Definitely the piCture pOlish ! OPI Fit to be Tied Gift Set - great polishes aside I am really loving the blingy-ness of the hair ties there! All of your prizes are great, but ooo, fingerless gloves - those are a great addition~! I have been lusting after Siren Song since I saw it. Alas, I am so broke. I'd love to try Siren Song! piCture pOlish Siren Song by you of course! Picture Polish Siren Song!! I have been lemming this one for a while, but since picture polish is a little more pricy than the average polish, I try and limit my impulse to buy them! I'd be most excited about Siren Song, of course! I don't have any Picture Polish shades and yours is so pretty! I'm most excited about the OPI Fit to be Tied Gift Set. Happy Blogaversary! I'm loving the OPI polishes! The fingerless gloves!! My polish area is in the coldest room of the house, and this winter has been brutal! I would love to have Siren Song! It is beautiful!!!!! Winning anything would be amazing. If pressed for an answer I would say SIren Song or Layla. Siren Song, Iris and Fingerless Gloves! OPI's Fit to be Tied, of course!! Thank you for this awesome giveaway and congrats on your blogiversary! I'm not so sure which prize would be the best because each one is gorgeous! Mmm..I guess the OPI pack would be great, as well as Nayla polish lol...thank you! I love OPI Fit to be Tied Gift Set! Ugh, your blog is already 3 y\o and I have just found it, so slow me! Congrats! Most excited for OPI Fit to be Tied Gift Set! Happy Blogiversary!!! I'd love to win - piCture pOlish Siren Song. because i've been following your blog and your nail art for so long, and i love your creative nail art! It'd be so cool to have something you created. I'm most excited to win Benefit Bad Gal Lash and Picture Polish Siren Song. Picture Polish Siren Song ,happy blogiversary!!! !i love your blog!!! I'm most excited for Siren Song as it'll be my first Picture Polish! I'm most excited for Picture Polish Siren Song as I have no Picture Polish polishes yet and this would be a great one to start off with! Happy Blogiversary!! Thanks for the fun giveaway! I'd love Siren Song. I'd love to try something from the Picture Polish line! I would love Siren Song! Great giveaway and happy 3 years! I would love to try Pop Beauty Eyeshadow Trio in Smokin Hot and Mica Beauty Tinted Lip Balm in Natural! My fav is Pop Beauty Eyeshadow Trio in Smokin Hot!